I grew up on a farm, and even though my life took me in a different direction, I still appreciate animals of all sizes. Therefore, whenever I go to Egypt, I enjoy seeing the camels. Here’s a gallery of my favorite photos that I have taken of camels over the years! When I went to Saqqara, Egypt to tour the ancient tombs, I saw this playful rascal. At first, he looked bored, but when he realized I was looking at him, he started making faces for the camera. It seemed to be fun for both of us! Photo copyright 2018 by Jewel, all rights reserved. Later, when I came back, the camel was still there, but now he was lying down. Once again, he made faces for me. Photo copyright 2018 by Jewel. All rights reserved. After I snapped the above photo, the camel continued to clown around for the camera, so I took another photo as well. 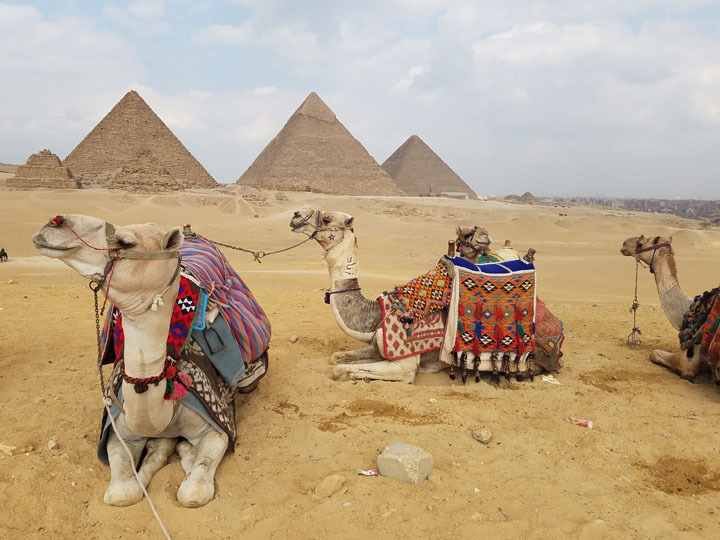 It’s fun to go for a camel ride at the pyramids of Giza. This camel enjoyed resting after carrying me to the pyramids, while I ran around with my camera taking photos. 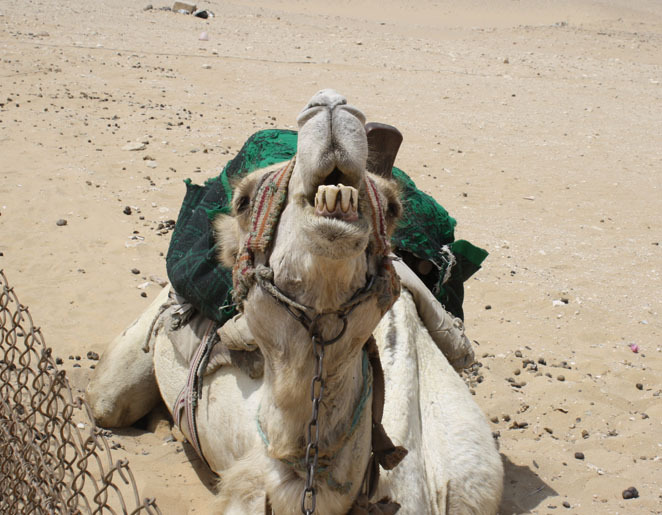 Going for a camel ride is a half-day commitment. 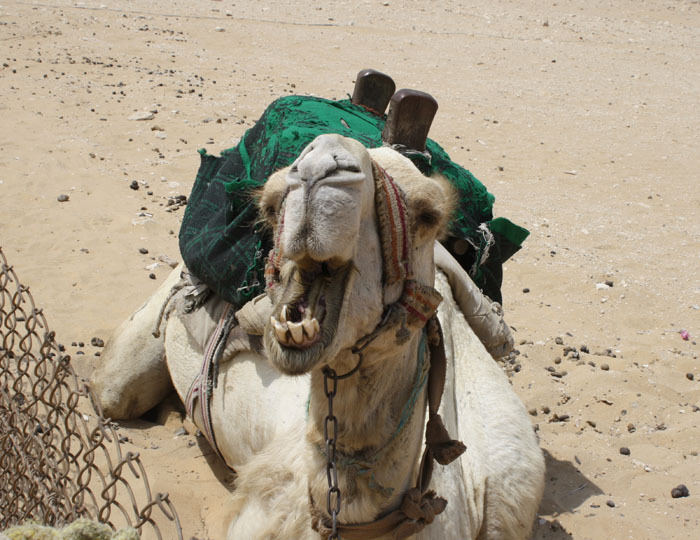 It’s a good idea to allow about 2 hours for the ride itself, and then afterward you might want to take a shower to wash off the camel smell and rest a bit. It can be very tiring to be out in the hot sun for that long. I strongly recommend wearing sunscreen for the ride. It isn’t easy getting on a camel. The handlers make the camel kneel, but the hump is so high that you need to lift your leg high to swing it up and over. Once you’re settled in the saddle, the camel gets to its feet. The first time I experienced this, I nearly fell off! 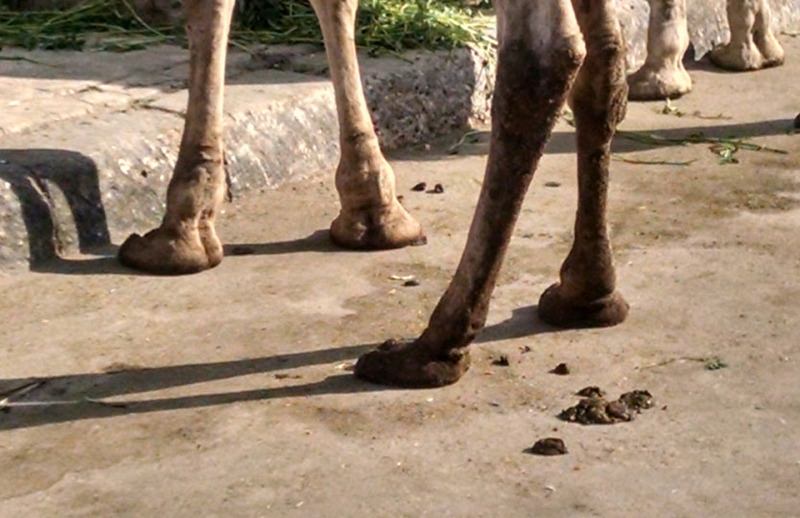 First the camel raises its back legs, causing you to pitch forward, and then it raises its front legs. Be prepared to squeeze the camel tightly with your thighs to stabilize yourself. 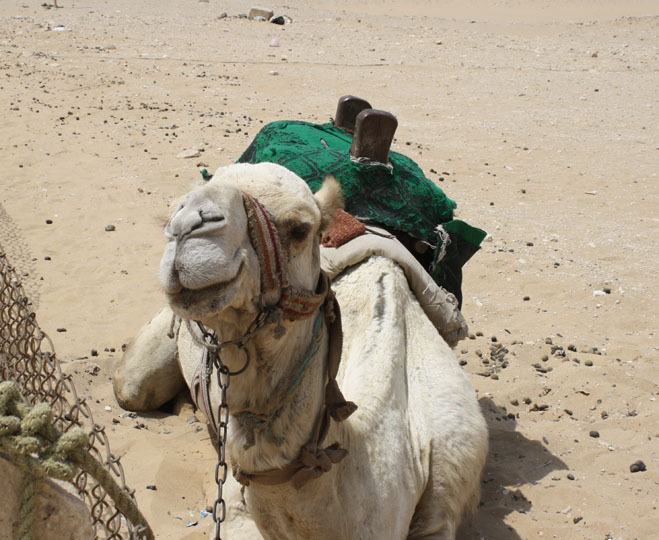 The last time I went for a camel ride, my camel’s saddle wasn’t cinched very well, and it kept slipping from side to side as the camel walked along. 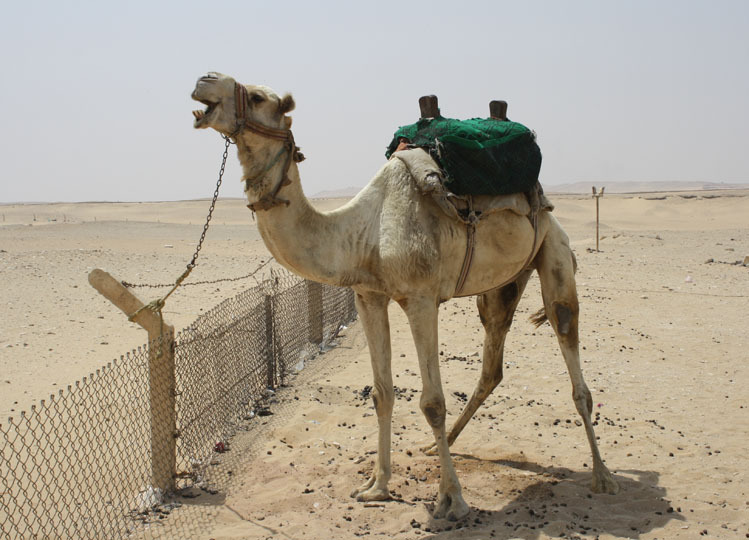 The handlers noticed, so they had the camel kneel down so I could get off, and they then tightened the saddle straps. 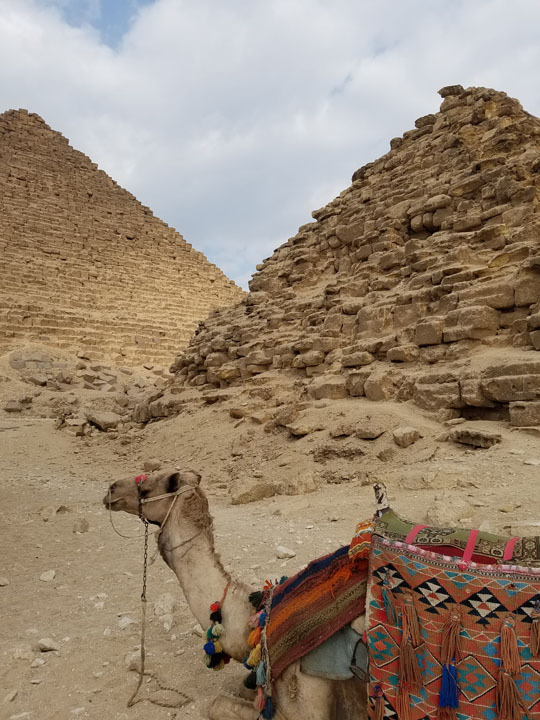 That same day, there were several additional times that they had the camel kneel down, and then get back up, so by the end of the day I had gotten quite a bit of practice keeping my balance for all of that! Photo copyright 2017 by Jewel. All rights reserved. Photo copyright 2016 by Jewel. All rights reserved. In Egypt, it is common for people to decorate their camels’ harnesses and saddle blankets with tassels. 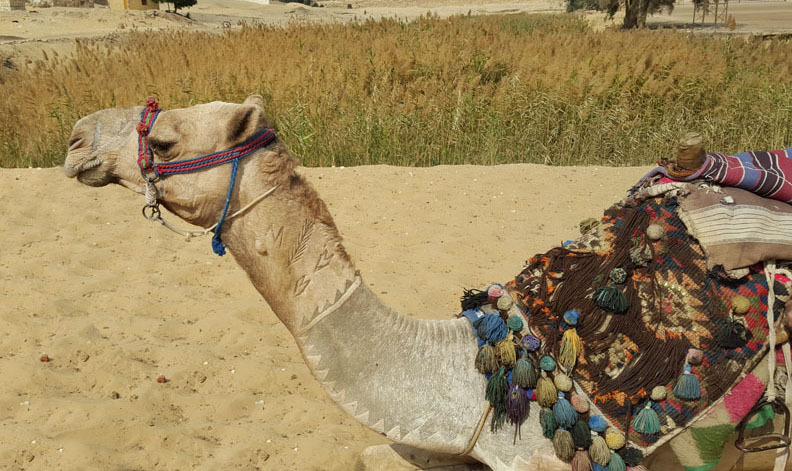 This camel’s halter is plain, but his saddle blanket is quite stylish. The camels had an opportunity to rest a bit while all of us explored the pyramids and took photos of each other. 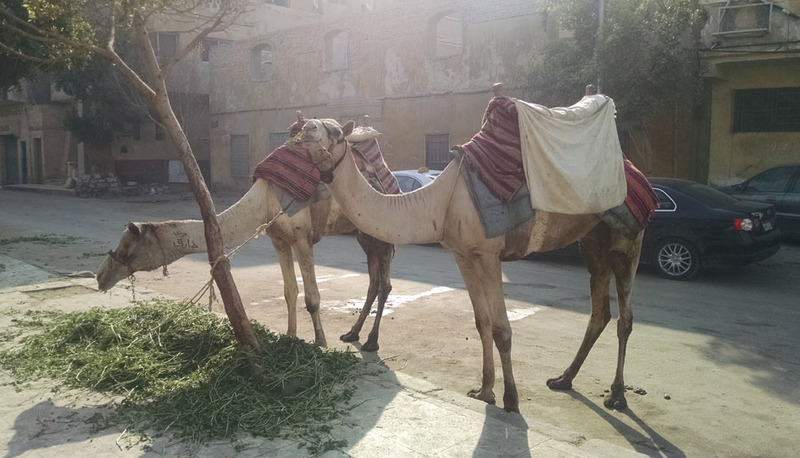 In parts of Giza (the part of the Cairo metropolitan area where the pyramids are), you can find cars parked on one side of the street and camels parked on the other side of the street. On the west bank of the Nile at Aswan, one of the tourist attractions is the Valley of the Nobles. 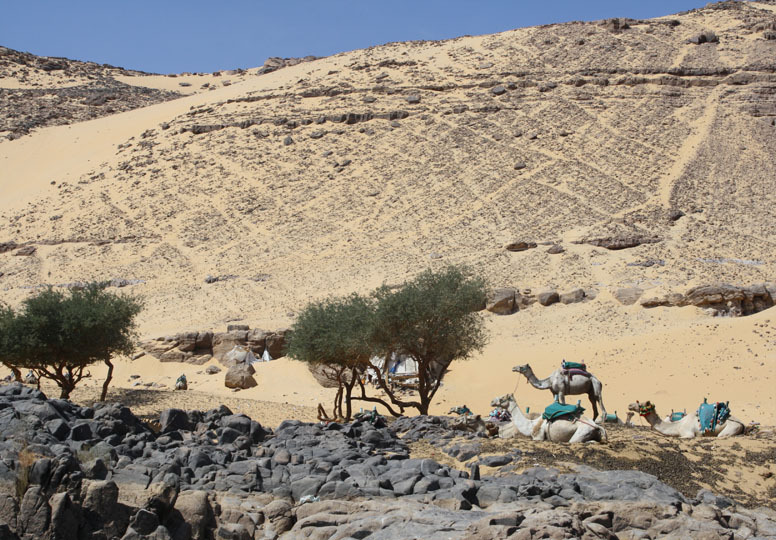 Tourists who want to visit it have a choice – they can either go for a camel ride up to where the tombs are, or they can walk up the steep hillside for about 30 minutes. Photo copyright 2015 by Jewel. All rights reserved. When riding via bus from Luxor to Aswan, the road runs parallel to the railroad tracks. 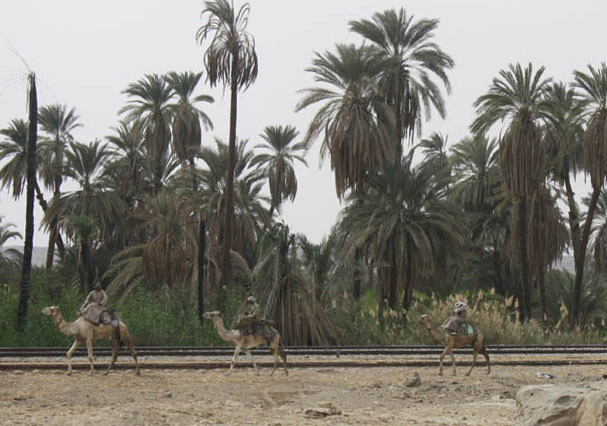 Somewhere between the towns of Edfu and Kom Ombo, I saw these camels traveling alongside the tracks.